It is vital to design a drainage system before you build your dream house or home to avoid unhealthy and disappointing situations during rainy seasons. Picture this; you build your dream home only to realize that the rainwater is forming a pool at your foundation or flooding on your neighbors’ property. It’s disappointing, right? For this reason, it’s vital to design a drainage system before you build your dream house or home to avoid unhealthy and disappointing situations during rainy seasons. Even though some planners and architects create a drainage plan when designing the house plan, you should always assess the project carefully to ensure everything about drainage is fabulous and according to your lifestyle. Remember it’s your long yearned dream house and nothing should go wrong. Therefore, keep reading, and you’ll find out the best ideas when creating a drainage plan for your dream home. The biggest mistake people make when building their dream houses or homes is starting the project without adequate funds. As a result, you find that there are no enough resources to create a drainage system for the home. Sadly, the building engineers leave the project without proper drainage, which basically makes the rainwater to run off to the surrounding property hence causing problems. To avoid such situations, you must first ensure that you gather enough funds for the project. Therefore, when you come up with the drainage plan that you want, consult your planners to know the amount to use in constructing that drainage system. Selecting a building site is essential when creating a drainage plan. Note that not all locations are suitable for some drainage systems. For instance, if your construction site is near a pool or near many trees, some drainage systems may not function properly as the trees may alter how excessive rainwater drains away from the house. Therefore, when selecting the building site, it’s advisable to involve surveyors as well as drainage or building engineers as they have the necessary information on the best drainage system depending on the location. Again, building engineers can help you gather crucial information about the building site. Note that it’s vital to carry out a soil investigation about your construction location. Actually, some soil porosity is not suitable for drainage systems, and especially for natural drainage. As a matter of fact, it’s advisable to carry out some soil test to know the bearing capacity of the soil in the site as well as the quality of that soil. This analysis can be done by the engineers you have by digging a few holes around the building site and filling those gaps with water severally to know how long it takes for that water to drain. If the water doesn’t sink, that means the site isn’t suitable for a proper drainage system and may lead to unhealthy situations if you construct your dream house there. That’s why you need to have all the information about the building site before you begin the project for you to create the best drainage plan. Remember that if the drainage system doesn’t work correctly, the rainwater may run off to your neighbor’s property, and you may be sued for that. To create a good drainage plan, it’s essential to ensure that the ground in the construction area has a proper sloping. According to research, to guarantee that the drainage system you design for your home is useful, you must ensure the sloping is correct. Remember that when the slope is appropriate, excessive rainwater will not seep. Actually, many designers recommend a drainage system which is not near the foundation and which is built on a downward slope. For you to have the best drainage plan, make sure the map is included when designing the house plan. In most cases, you find that the designers forget to incorporate where the drainage system will be, which makes it difficult to create a drainage plan when the construction of the house is already underway. According to drainage experts, it’s vital to include the position of the perimeter drain system, gully traps, sewer line, or even a chain drain on the house plan. With this inclusion, you may not encounter challenges when planning about the drainage system of your house. When locating the building site, it’s advisable to know where the public sewer is located. 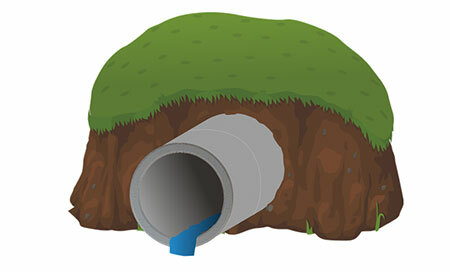 Remember that all the excess water and other waste should be directed to the main drain. However, without appropriate information on where the municipal sewer is, it can be challenging to create a useful drainage plan for your dream house. Therefore, ensure that you include the location of public sewer on your site plan to make it easy to create a drainage plan. Sometimes engaging various experts is crucial when deciding on the best drainage plan. For instance, you may want to have the opinion of a structural engineer, an architectural designer, landscape designers, or that of planning consultants before deciding on the final drainage plan for your dream house. Remember that it’s your dream house and every aspect must be outstanding. You, therefore, need to explain your lifestyle, taste, and preference to the building team to ensure that all the ideas they provide will be useful in creating the drainage plan that suits you best. Some people create a drainage plan which is challenging for architects to fix in the house. For this reason, builders end up constructing a drainage system which is not useful. To avoid this, it’s good to conduct thorough research on the best drainage system with clear installation instructions. For instance, EasyMerchant's product page provides all important information about channel drainage including a step-by-step process of installing it. This makes it easier for any architect to construct the drainage system without challenges. It’s always vital to come up with a good plan outlining how you would like the drainage system of your dream house to look like. However, it’s not advisable to start the project without enough funds as you may end up leaving the home without good drainage. Also, having the necessary information about the building site is essential when creating the drainage plan. It’s also vital to involve various experts when creating the plan, as they may help you decide on the drainage system which is not complicated. Additionally, the experts can help you come up with an appropriate scale for both house and drainage plan.